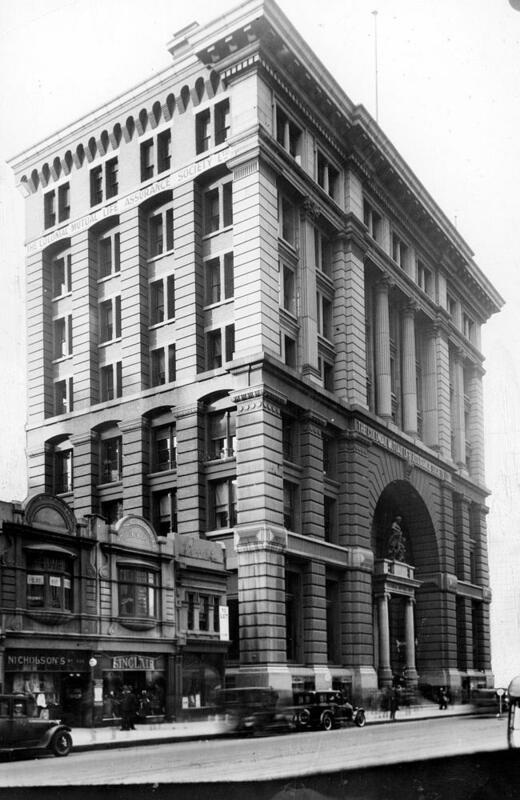 In 1890, the Equitable Life Assurance Society of the USA paid Â£360 000 for a rectangular block of land, measuring 132 by 79 feet, on the NW corner of Collins and Elizabeth Streets. The Company wanted to erect the "grandest building in the Southern Hemisphere" and spared no expense doing so. A noted Austrian architect, Edward E. Raht, was engaged to design the building. 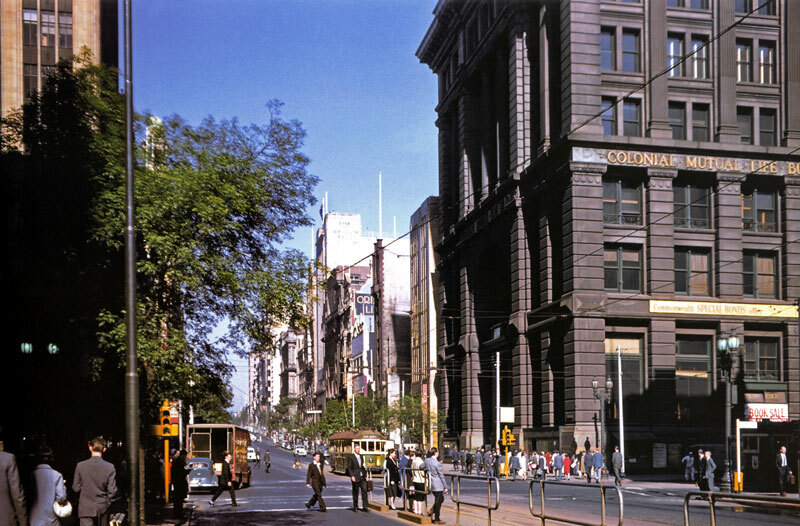 The general contractor was David Mitchell, who had constructed many other fine Melbourne buildings. Four years and four months elapsed between the first contract for excavations, in November 1891, and the building's opening by the Governor, Lord Brassey, in March 1896. The foundation stone was laid in March 1893. Raht opted for an 'Americanised Renaissance' style for the building. For such a mammoth construction, he wanted traditional materials in vast quantities, so contracts were let for local granite and imported marble. Like a palace, the building was supposed to last forever, so innovative construction techniques were needed to lift and lock together the giant granite blocks. When completed, the building rose to a height of 138 feet, with seven stories, and dominated the streetscape. Grey granite quarried at Harcourt, near Mt Alexander, was used for most of the construction. Beneath the grand archway forming the entrance on Collins Street was a portico assembled from pink granite quarried at Cape Woolamai, on Phillip Island. Blocks of this granite were also used for the base-course. 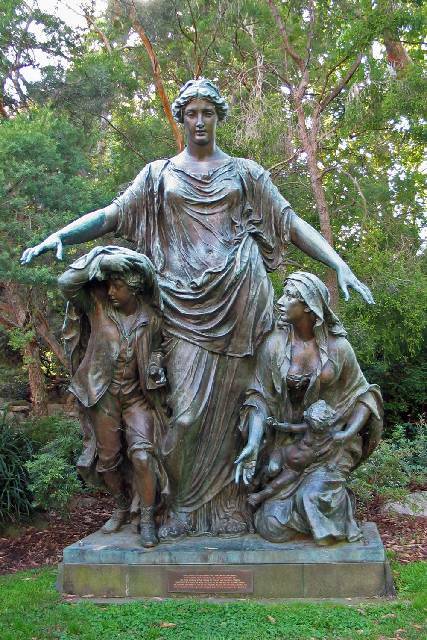 Above the entrance was mounted a piece of symbolic statuary cast from metal. Corinthian columns spanned the 41 feet between the third and fifth floors. Some of the decorative friezes and capitals represented stonemasonry at its very best. The interior woodwork - ceilings, doors and window frames - was of the best cedar, joined to perfection. Not a nail was used anywhere. The interior stonework, mostly marble, was just as lavish. White Italian marble was used for the floors and many walls. Elaborately carved and polished Belgian marble was used in skirtings, dadoes and architraves. The roof and downpipes were of copper. The all-up cost of the building was £233,000, including £72,000 for the supply of the granite. 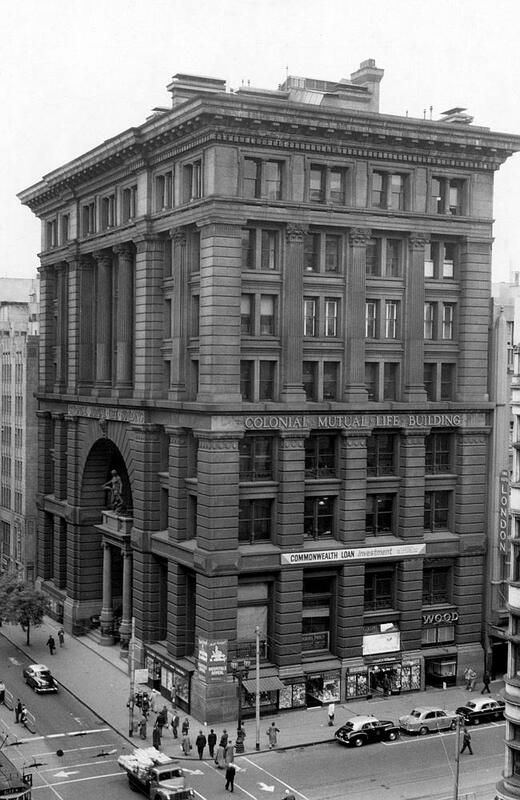 The Equitable Company occupied the building until 1923, when it was sold to the Colonial Mutual Life Assurance Society Ltd.ed. The new owners paid £280,000, less than half of the original total cost. Despite its status however, by the late 1950s the building was becoming uneconomic. While structurally solid, its very lavishness, especially its high ceilings, was its doom. Experts, including the National Trust, were consulted but, despite the building's grandeur and opulence, it was not considered worthy of preservation. 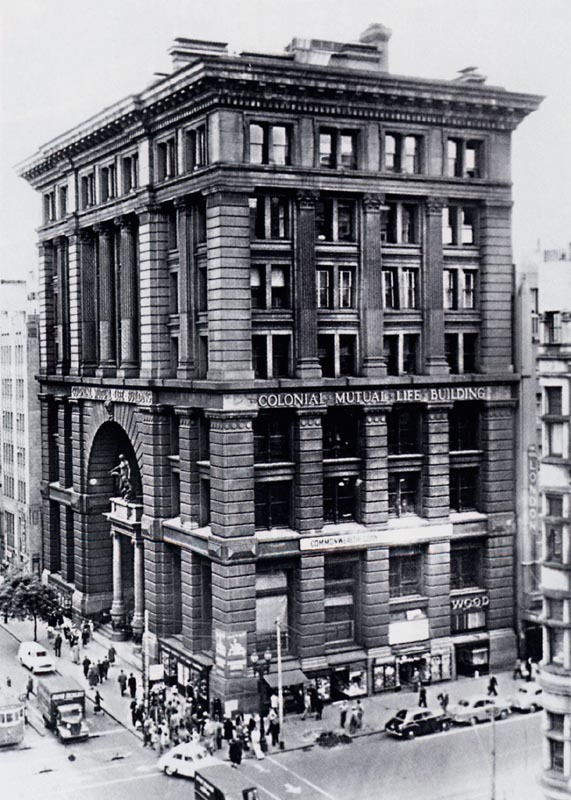 In July 1959, CML's call for tenders for demolition was won by Whelan the Wrecker; by the end of 1960 the landmark building had gone. The contents of a copper time-capsule uncovered during the demolition were returned to the New York headquarters of the Equitable Life Assurance Company. The new building erected in its place used some of the original grey Harcourt granite for exterior facing panels. Some of the interior marble fittings were sold for use in buildings elsewhere in Melbourne. The magnificent bronze statuary group, representing the 'Equitable' protecting the 'Family' survives at the University of Melbourne (first photo) and fragments of the granite facade are displayed on the forecourt of the REB/Melbourne Museum (second photo). Some rue the demolition of the Coffee Palace or the Australia Building but I think this is our greatest loss. The ‘ruins’ at the museum are worth looking at.